Imagine you’re the creator of Dragon Quest ($2.99). You’ve successfully streamlined the somewhat impenetrable RPG genre to a point where anyone and everyone can play the game and enjoy it, and now it’s time for a sequel. Obviously, people are ready and asking for something a bit bigger and more complex, and simply delivering something in the same scope as the first game isn’t going to satisfy them. How far do you walk the concept back to its inspirations, Wizardry, Ultima, and the like? That’s a question I suspect Yuji Horii grappled with when coming up with Dragon Quest 2 ($4.99) , and while he wouldn’t hit the sweet spot until the next installment, it’s undeniable that the sequel to Dragon Quest is a considerably bigger and slightly more sophisticated game. The biggest change in the gameplay comes from battles going beyond the one-on-one affairs found in the original game. Not only do you have more than one character in your party, but the enemies come in groups now, too. This adds a lot more strategy to the combat since there can now be monsters that are there for support reasons, casting buffs, debuffs, and healing spells to aid their beefier teammates. Naturally, the same goes for your team. I guess even the presence of those buffs and debuffs is a major new addition, since the first game had none. There are also more status effects, and if you’re used to the Final Fantasy series, you might be surprised to find that they actually work on enemies here. This all probably sounds quaint from a modern point of view, but for people in 1987 who had just cut their teeth on the first Dragon Quest, the combat system here was significantly more complex. 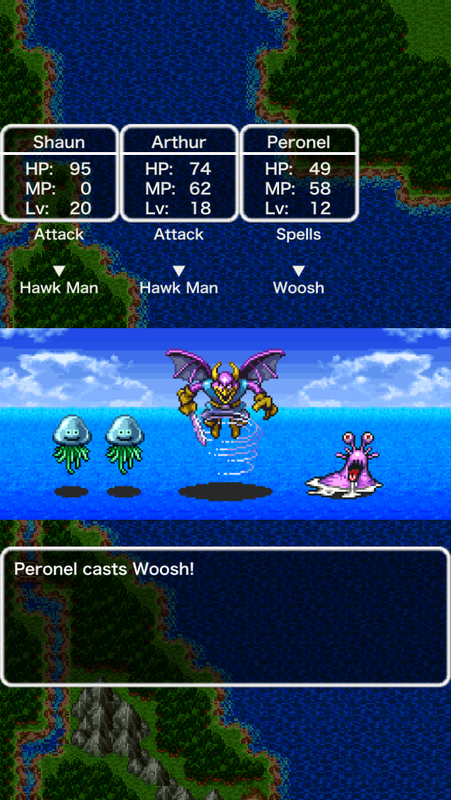 There would be very few significant changes to this battle system in later Dragon Quest games. I think it’s very interesting how the design seems savvy to that audience, with the first part of the game where the hero is alone feeling very similar to the original game. Even the enemy groups don’t throw you for much of a loop, simply combining straightforward attackers rather than playing around with any actual complementary tactics. The hero in this game is a bit of a brute, with no magical ability whatsoever, so the early part of the game doesn’t involve a great deal of strategy past whacking things with your weapon and going to the inn when your HP runs low. The next party member you’re likely to get is a bit more like the hero from the first game, with his early magic spells dedicated to healing, clearing status ailments, and directly attacking enemies. After you’re comfortable with the idea of magic and managing your MP, the game then brings in the third character, who is largely useless as a melee attacker and instead quickly learns spells for debuffing, inflicting status ailments, and attacking large groups of enemies. Around this time, the enemies start to get more clever in their groupings, so you have to make use of your new-found tools and start paying attention to the order you’re taking them out. It’s a very elegant bit of design, I think, and it shows the level of thought that went into this game. It’s also noteworthy how carefully the game fences you in until you’ve found all of your party members and had some time to get used to each of them. After you find the ship, though, all bets are off, and it’s here where the game starts to go off the rails a little bit, in my opinion. The ship in Dragon Quest 2 is not like the ships in many other games. Once you have it, you can go anywhere on the map, disembarking on any square you would ordinarily be able to walk on. It’s a tremendous bit of freedom, allowing you to explore any place you think looks interesting, with only the threat level of the random encounters serving as a sort of soft gate. Unfortunately for some, that’s just what the game expects you to do. You’ll get a few vague hints if you talk to everyone, and at the very least, this remake cuts down on searching for needles in haystacks somewhat by using a shiny indicator for tiles you should search. By and large, however, you’re expected to go and check around every bit of land for points of interest. The game’s map isn’t huge by modern standards so it’s not completely impenetrable, but it’s certainly an aspect later games in the series would handle with a bit more grace. In the grander context of the series, this game is usually considered the most difficult of the bunch, mostly thanks to its absolutely dreadful endgame crawl and a final boss who can and will use a spell that restores every last one of his HP. Find a Dragon Quest veteran and simply speak the words “Cave of Rhone" to watch them involuntarily wince in pain at the memory. Some of the sting has been taken out of the remake by things like allowing you to make a quick save at any time, having your characters auto-target another enemy if the one they were originally assigned to is killed, making adjustments to gold and experience drops, and even slightly modifying maps. You’re also given the world map from the very start, and the way it highlights points of interest can help a bit with getting you on track when you’re lost. That said, there’s no mincing words about the fact that you’ll still need a very lucky draw on the last boss’s AI pattern to pull out a victory at any reasonable level. Every time I play Dragon Quest 2 again, I find myself wondering why I rank it so low in the series up until I reach that last bit of the game, only to have that reminder slammed hard into my face. It’s hard to sort out my exact feelings about the game. I think it’s definitely worth playing, and it’s hard to imagine anyone who liked the first game not liking this one, too. When you consider the game followed only several months after the first and nearly a full year ahead of Final Fantasy ($7.99), its complexity is impressive and its faults are perhaps a little more forgivable. In that attempt to go so much bigger, however, the game ended up with a lot of rough, experimental bits that even the remake can’t fully smooth out. The follow-up, Dragon Quest 3, would end up fully delivering on the promise of this game, which makes Dragon Quest 2 significant but also something of a half-step. It’s a big game, running more than double the length of the original, but the price it pays for that is being a much more uneven experience. This version of the game, like the one we recently received of the first game, is a port of a Japan-only feature phone game from 2005. It’s loosely based on the Super Famicom remake that we never saw officially released in English, but if you played the Game Boy remake, it’s mechanically quite similar. Certain modifications have been made to make the game easier, and you can save anywhere, which is great because that really should be a standard feature on any handheld RPG. This version also helpfully stops you from embarking on the long, nasty, final road if you don’t have everything you need to beat the game, fixing one of the original version’s worst points. The graphics have been stretched out of proportion once again to fit the different aspect ratio of modern smartphones, leading to a kind of weird look that takes some getting used to, and the scrolling isn’t as smooth as I’d prefer. Like the original game, the game’s new localization attempts to use a older-sounding faux-Elizabethan-style English to evoke the classic NES release. It’s decent enough, and fairly consistent with other recent Dragon Quest translations. 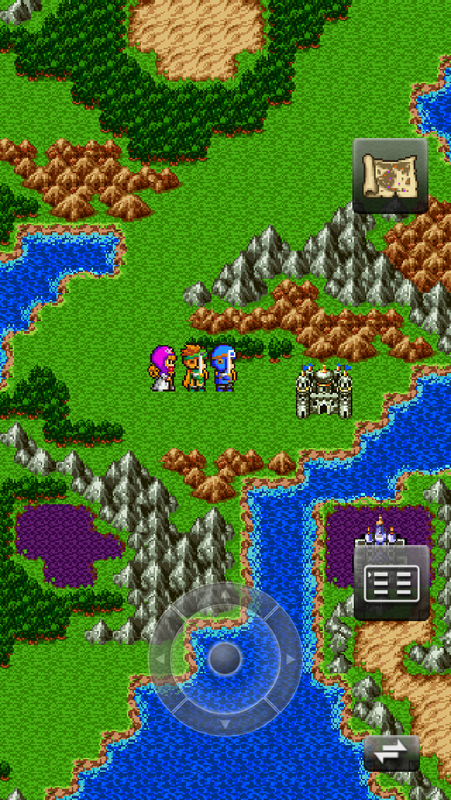 The game is portrait-only and uses the same control layout we’ve seen in the other Dragon Quest releases. It’s a great game to play one-handed, but if you’re not used to touch controls, there are a few dungeons where you might get frustrated at the precision of movement required. The music has been replaced with the symphonic versions, a particular treat this time as, for whatever else might be said about Dragon Quest 2, the game’s soundtrack is among the best in the series. There are also unfortunately a couple of bugs in the game at the moment, seemingly related to the quick save feature. The game will occasionally start with sound effects completely muted, and it will sometimes crash if you talk to shopkeepers when your inventory is full. There are ways around both issues, but I certainly hope they’re fixed before too long. 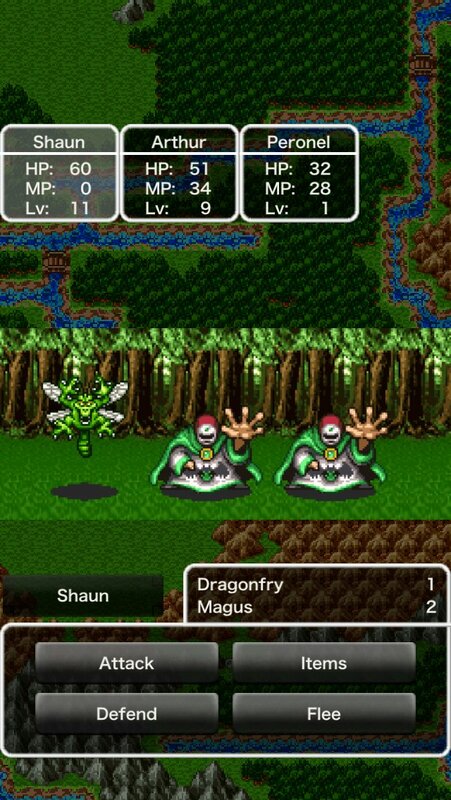 Like other Dragon Quest games on iOS, there isn’t any support for Game Center or MFi controllers. Even though it’s far from my favorite Dragon Quest game, I think it’s still a pretty good game. The adventure is long and gives you plenty to chew on, and the price is very reasonable. This is without a doubt the best version of Dragon Quest 2 we’ve had officially released in English, and if you enjoyed the recent release of the first game, you should have no concerns about jumping in here and taking on the next adventure. It still has its flaws, but for a game coming up on its 28th birthday, it’s more enjoyable than you might expect. If you remember it from the NES days, kindly or otherwise, you can at least be assured that if you choose to revisit it now, you’ll find it to be a much better experience thanks to the tweaks and balances. I still can’t help but see this as the awkward steps towards the brilliant Dragon Quest 3, but just as there is no bad pie, there is also no bad Dragon Quest. 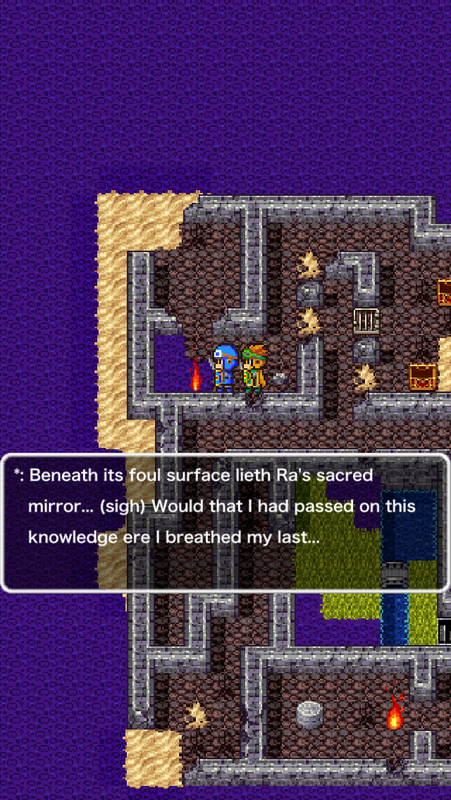 Previous PostPrevious ‘RPG Soul Of Deva’ Review – Are We Sure This One’s Kemco?